The Pallet Changer is the most sophisticated pallet transfer machine offered by Premier. This pallet changer allows for an operator to change the pallet beneath a load without having to touch them. Our Pallet Changers are custom built for our customers looking for specific stack heights and where loads are stable while resting on their side. The side clamping system ensures a load will maintain its integrity. 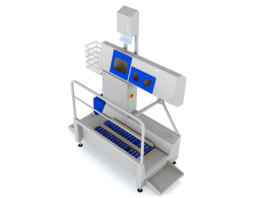 The Pallet Changer is a completely automated system and fitted with fixed guarding.